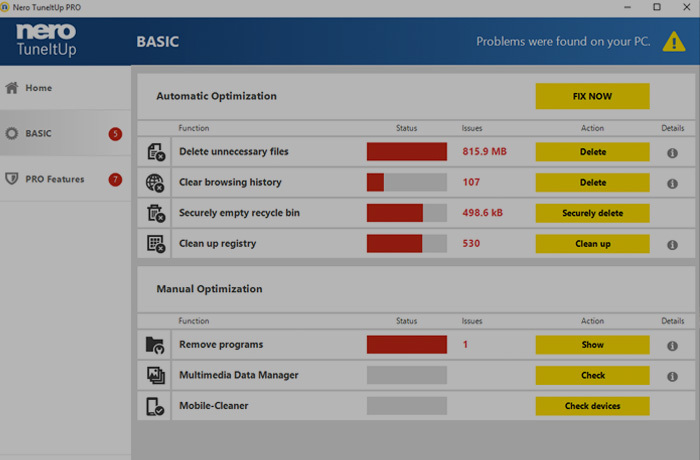 Nero TuneItUp: now with continual Autopilot checks, High-Speed Turbo Mode and a Mobile Cleaner – for FREE. Karlsruhe, Germany, July 20th, 2016. 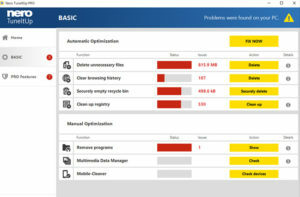 A new release of Nero TuneItUp keeps PC’s running smoother, more efficient and quicker than ever before. Everyone is after a computer that runs without problems, starting up rapidly and loading programs with ease. When this breaks down, it is most likely due to memory problems or fragmented documents that hinder the performance. The latest version of Nero TuneItUp boasts three new major features: Autopilot, High-Speed Turbo Mode and Mobile Cleaner that work to ensure computers and mobile phones are working at their optimum! The NEW Autopilot feature gives users intelligent ‘on-demand’ checks and is constantly watching ‘live’ for potential problems; reacting immediately if an issue is found. This means that any issues are being shown as they occur which results in fewer and smaller on-demand checks, ultimately meaning better performance. Users have a sense of safety and peace of mind knowing the software is continually working in the background. Other features of Autopilot include the blocking of unnecessary or unwanted software, a constant prioritising of processes and the ability to search for driver updates to name just a few. The PRO version will fix all problems automatically as and when they are found with the option for the user to ‘roll back’ if required. NEW High-Speed Turbo Mode instantly frees up RAM and CPU resources which boosts games and resource hungry applications. The feature is fully customisable and displays how much RAM was released. NEW Mobile-Cleaner allows users to check and clean their mobile directly from their PC. The Android App is available free of charge. Get it on Google Play. Nero TuneItUp PRO users benefit from all the new features as well as a NEW Defrag module. Here, users will gain faster and more efficient access to their hard drive as the defrag module rearranges fragmented data on both the PC and removable storage devices. The free version will allow users to see how defragmented their drives are and, will give be given the option to upgrade should they wish to fix the issue. More detailed results and easier to understand reports. An improved user interface with sortable lists and customisable recommendations. Improved Cleaner module that performs deep scans and checks for old Windows installations. File shredder that now supports SSD and multiple partitions. The new release of Nero TuneItUp is available from the 20th July 2016. Nero TuneItUp PRO is available at a suggested price of USD 34.95 per year or for USD 54.99 per year for up to three PCs. For more information, visit www.nero.com. Intelligent on-demand checks.Replacing the need for scheduled checks if a problem is found. Delete junk files when the disk is full. – Constant prioritising of tasks.Giving lower priority to background tasks and more resources to foreground applications. – Automatic update search from crashed programs. – Blocking of unnecessary auto start entries and software such as toolbars, adware etc. – Delete internet traces after closing web browser. – Automatic High-Speed Mode if certain programs are opened such as video editing software for example. – Prevention of standby mode if an upload / download is active. – Fully automated PC maintenance. – Search of huge folders. – Search for driver updates after a system crash or critical system error.